Twenty-six spreads depict fun illustrations with real facts about pirates. The simple text for young readers is written in rhyme for each letter of the alphabet. More detailed information is written for the more advanced readers to learn more about each topic covered. An introduction tells more about the history of pirates since as early as 400 AD to the Middle Ages and the 17th Century “Golden Age of Piracy’. And a Question and Answer section at the back of the book tests the reader’s knowledge about pirates given in the book. Eve Bunting gives so much information in this one simple book, that a reader may wish to read only a page or two at a time or browse the alphabet for an interesting treasure. John Manders not only illustrates each topic beautifully, he entices the reader to find out more about pirates. The details in the artwork are both educational and fun to view. 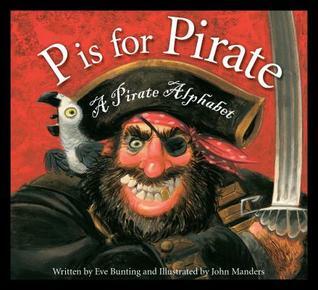 I really found this book to be one of the best in the line of alphabet books and non-fiction texts about pirates. It was extremely well researched, documented, and illustrated. And I love that it can be enjoyed on many different levels.